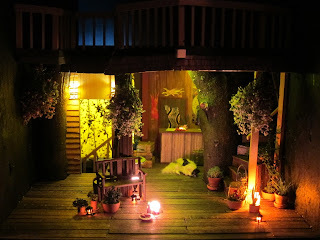 The treehouse hotel series, begun in 2008 with Cafe Mena, was one of my first miniature projects (the third piece I ever made I think). Like all of the series, the guest room is built in 1:24 scale, which allows for a good amount of detail but keeps the overall size small enough to manage. The first piece was Cafe Mena. 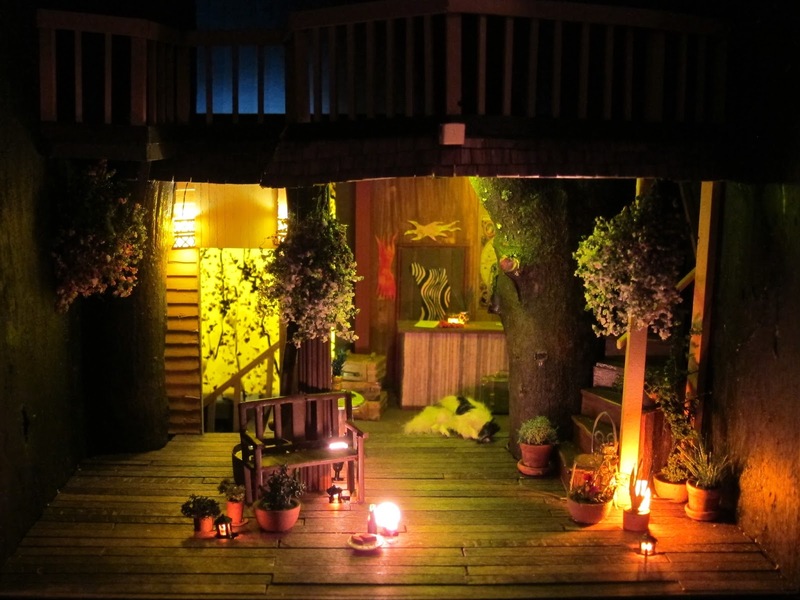 It is the place guests in the treehouse hotel go to dine. The second piece was the Lobby: the first place guests check in after climbing the long winding stairs to get there. Now we have Unit #7, one of the best of the guest rooms, featuring a living area, bath overlooking the forest through a round window, and a beautiful bedroom with dark wood and views on all sides. It is stunning. The pictures look like real life room settings. Pure awesomeness! OOO enchanting! Great mood and design! Thanks everyone ~~ I love this fantasy type of sprawling treehouse!